The Statue of Lenin in Seattle is a 16 ft (5 m) bronze sculpture of Communist revolutionary Vladimir Lenin, by Bulgarian sculptor Emil Venkov. It was completed and put on display in Communist Czechoslovakia in 1988, the year before the Velvet Revolution of 1989. In 1993 the statue was bought by an American who had found it lying in a scrapyard. He brought it home to the U.S. state of Washington, but died before he could carry out his plans for displaying the Soviet era memento. Since 1995 the statue has been held in trust waiting for a buyer, standing on temporary display for the last 24 years on a prominent street corner in the Fremont neighborhood of Seattle. It has become a Fremont landmark and is often decorated, or vandalized. The statue has also sparked political controversy, with commentators discussing it in light of the removal of Confederate monuments and memorials. The statue was constructed by Bulgarian sculptor Emil Venkov (1937–2017) under a 1981 commission from the Communist Party of Czechoslovakia. While following the bounds of his commission, Venkov intended to portray Lenin as a bringer of revolution, in contrast to the traditional portrayals of Lenin as a philosopher and educator. Venkov intended the statue to function as a critique of communist oppression and depict Lenin as a violent man, with abstract rifles and flames on the statue, in contrast to the traditional depiction of Lenin holding a book. Venkov's work was completed and installed in Poprad, Czechoslovakia (now Slovakia), in 1988 at a cost of 334,000 Kčs, (equivalent to US$190,000 in 2018), shortly before the fall of Czechoslovak communism during the 1989 Velvet Revolution. Lewis E. Carpenter, an English teacher in Poprad originally from Issaquah, Washington, found the monumental statue lying in a scrapyard with a homeless man living inside the hollow statue. The Lenin statue was waiting to be cut up and sold for the price of the bronze. Carpenter had met and befriended the sculptor, Venkov, in an earlier visit to Czechoslovakia. Carpenter's initial interest in buying the statue was to preserve it for its historic and artistic merit. Later he intended to use it to attract customers for an ethnic Slovak restaurant he wanted to open in Issaquah. In close collaboration with a local journalist and good friend, Tomáš Fülöpp, Carpenter approached the city officials with a claim that despite its current unpopularity, the sculpture was still a work of art worth preserving, and he offered to buy it for US$13,000 (equivalent to US$20,000 in 2018). After bureaucratic hurdles, he signed a contract with the Mayor of Poprad on March 16, 1993. The Mayor then began to reconsider, and asked the City Council to vote on the sale. After they voted to approve it, the Poprad council reconsidered, and asked the Slovak Ministry of Culture for its blessing, which they gave four more months later. After final approval to buy and move the statue out of the country, Carpenter consulted with both Venkov and the architect who had overseen the original casting of the bronze before deciding to cut the statue into three pieces and ship it 1,500 mi (2,400 km) to Rotterdam, and then on to the United States, all of which ultimately cost US$40,000 (equivalent to US$70,000 in 2018). Carpenter financed much of that by mortgaging his home. The statue arrived in Issaquah in August 1993, and Carpenter planned to install it in front of a Slovak restaurant. He died in a car accident in February 1994, during public debates on whether to display the statue in Issaquah that ended in rejection from the suburb's residents. After Carpenter's death, his family planned to sell the statue to a Fremont foundry to be melted down and repurposed into a new piece. The foundry's founder, Peter Bevis, sought instead to display the statue in Fremont, and agreed to have the Fremont Chamber of Commerce hold the sculpture in trust until a buyer was found. The statue was unveiled on June 3, 1995, at the corner of Evanston Avenue North and North 34th Street on private property, one block south of a salvaged Cold War rocket fuselage, another artistic Fremont attraction. The owners moved the statue two blocks north to the intersection of Fremont Place North, North 36th Street and Evanston Avenue North in 1996, adjacent to a Taco del Mar and a gelato shop. The new location is also 3 blocks west of the Fremont Troll, another Fremont art installation situated under the Aurora Bridge. The Carpenter family continues to seek a buyer for the statue. As of 2015[update] the asking price was US$250,000, up from a 1996 price of US$150,000 (equivalent to US$240,000 in 2018). The statue of Lenin became a Fremont landmark and object of curiosity, representing the quirky nature of the artistic neighborhood, whose motto is Libertas Quirkas — freedom to be peculiar. Like the Fremont Troll and the Waiting for the Interurban sculpture, the Lenin statue is often decorated, appropriated, or vandalized with various intentions, both whimsical and serious. Knute Berger, acknowledging that "we are supposed to be amused" by the "hippie whimsy" of a Soviet symbol in the middle of an American city, said that seeing the statue cannot help but remind us of the killing and repression Lenin inspired. But Berger reflected that perhaps the meaning of this Soviet relic is the opposite, that it is "a trophy of Western triumphalism", representing the victory over communism and the fall of the Berlin Wall. By removing the statue from its original context where it was meant to keep the Slovak people in awe, given a new context where it oppresses no one and is used entirely in the service of free enterprise and profit making. Berger goes on to compare the Lenin statue with Native American totem poles, so many of which were once on display in the city that they became a "symbol of Seattle". Some of Seattle's most iconic 'totem poles' (actually Alaskan Tlingit carved house posts) were brazenly stolen from an Alaska village by respected members of the scientific and business community, the Harriman Alaska expedition, so immersed in the triumph of their own culture over that of Native Americans that little thought was given to what Dr. Robin K. Wright of the Burke Museum called "a very clear case of theft". Berger said the story of victory of one culture over another told by the totem pole, or the Lenin statue, make it "an icon, but if you know the story, a complicated one." A glowing Soviet-style red star or Christmas lights have been added to the statue during the holiday season since 2004. For the 2004 Solstice Parade, the statue was made to look like John Lennon. During Gay Pride Week, the statue is dressed in drag. The Lithuanian envoy to Washington D.C., Zygimantas Pavilionis, said the 2014 Russian military intervention in Ukraine was evidence that the threat of Russian imperialism should not be treated playfully, as Seattle did with "that ugly monument to Lenin there", because, "one day you will wake up and instead of 'Go Huskies' you have those self-defense units without insignia with Russian plates defending you." The BBC highlighted Seattle's Lenin statue after protesters removed Lenin statues in Ukraine. The statue's hands are often painted (and repainted) red to protest what critics perceive as the glorification of what they see as a historical villain who has blood on his hands. The Taco del Mar restaurant, one of the retail property's tenants, constructed a monumental-scale burrito wrapped in foil for the statue to hold, which one Fremont publisher said did not turn out as intended, but rather "looked like a doobie." In June 2017, the statue's sculptor, Emil Venkov, died at age 79. The Association of Slovak Artists noted the loss of an artist whose long career helped define Slovak monumental and architectural sculpture, creating works distinctive for their subtext. Alt-right media have held up the example of the Fremont Lenin statue to protest the removal of Confederate monuments and memorials in the US. On August 16, 2017, in the wake of the Charlottesville, Virginia Unite the Right rally, pro-Trump Twitter conspiracy theorist Jack Posobiec led a gathering of several protesters at the statue to demand its removal. 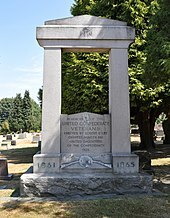 The same day, Mayor Ed Murray said his office contacted Lake View Cemetery to "express our concerns" about the United Confederate Veterans Memorial there, and asking for its removal. On August 17, Murray added that he believed the Lenin statue should go as well, because we should "not idolize figures who have committed violent atrocities and sought to divide us", and saying that the Lenin statue was also on private property. In the following days, a city staffer told The Washington Post off the record that the Seattle City Council is considering debating a symbolic resolution on removing the Lenin statue and the Confederate memorial, though the city government has no power to remove either against the wishes of the owners, since neither monument, nor the properties they are on, are city-owned. In an article discussing Confederate monuments in USA Today, Allen Guelzo said that there should be a movement of protesters asking that the statue be removed, as Lenin's "murderous ideas and deeds dwarf any of [the] sins" of Robert E. Lee. A bill introduced to the state legislature in early 2019 by a group of Republican representatives called for the statue's removal and replacement, allegedly in response to a bill reconsidering a statue of Marcus Whitman at the Washington State Capitol. ^ a b c d e Watson, Emmett (September 12, 1993). "No capitalist, Lenin isn't for sale; but you can try to rent him". The Seattle Times. p. B2. ^ Murakami, Kery (December 3, 2004). "Lenin is the star attraction at an only-in-Fremont holiday lighting". Seattle Post-Intelligencer. Retrieved October 2, 2016. ^ a b c Sweedler, Maya (June 11, 2017). "Emil Venkov, sculptor of Fremont's Vladimir Lenin statue, dies in Slovakia". The Seattle Times. ^ "Story of the Statue of Lenin". Fremont Chamber of Commerce. ^ Tan, LiLi (December 3, 2017). "Lenin statue 'silent protest against communism,' says family member". KING 5 News. Retrieved April 29, 2018. ^ a b c d e f g h i Corsaletti, Louis T. (May 7, 1993). "With Lenin, local man has statue of limitations—it's hard to travel with 7-ton bronze". The Seattle Times. p. B2. ^ a b c Bush, Evan (September 11, 2015). "From Fremont to Berlin, Lenin sparks controversy". The Seattle Times. ^ Fülöpp, Tomáš J. (May 6, 1993). "Obrovský Lenin putuje ako skladačka". Slovenský východ (in Slovak). Košice, Slovakia. Archived from the original on May 25, 2014. Retrieved May 28, 2015. ^ White, Dan (October 30, 2008). "A Seattle That Won't Blend In". The New York Times. p. D1. Retrieved October 2, 2016. ^ Fülöpp, Tomáš J. (February 24, 1994). "Zahynul Lew Carpenter". Podtatranské noviny (in Slovak). Poprad, Slovakia. Retrieved May 28, 2015. ^ de Leon, Ferdinand M. (June 1, 1995). "Lenin moves into Fremont—bronze statue moves from 'burbs to Fremont". The Seattle Times. p. B1. Retrieved October 2, 2016. ^ a b Bjorhus, Jennifer (October 18, 1996). 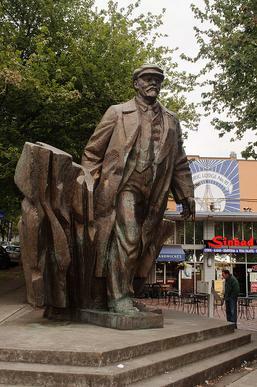 "Lenin dusted off and on feet again—back home in Fremont". The Seattle Times. p. B1. Retrieved October 2, 2016. ^ Tsong, Nicole (May 23, 2008). "At Royal Grinders, a toasty sub and a scoop (or 2) of gelato". The Seattle Times. p. H16. Retrieved October 2, 2016. ^ "Mapping The Public Art That Makes Fremont So Quirky". Curbed. October 28, 2014. Retrieved March 2, 2018. ^ Berner, Alan (April 13, 2015). "Lenin statue is loved, hated — and very Fremont". The Seattle Times. p. A1. Retrieved October 2, 2016. ^ a b c d Berner, Alan (April 12, 2015). "Lenin statue is loved, hated — and very Fremont". The Seattle Times. ^ Sainsbury, Brendan; Brash, Celeste (2014). 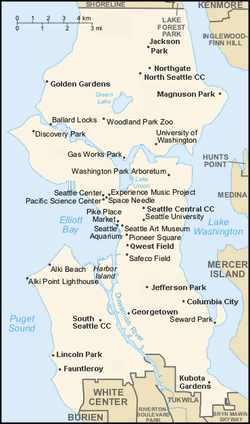 Lonely Planet Seattle. Lonely Planet. p. 357. ISBN 9781743218273. ^ Cohen, Stephen (June 1, 2017). "Fremont's Lenin in focus after removal of Confederate monuments". Seattle Post-Intelligencer. ^ a b c d Berger, Knute (April 19, 2011). "Icons we could do without". Crosscut.com. ^ Wright, Robin K. (November 19, 2015). "How did totem poles become a symbol of Seattle?". Burke Museum of Natural History and Culture. ^ Mapes, Lynda V. (August 27, 2005). "Tlingits bring a story full circle with posts for Burke Museum". The Seattle Times. ^ Murakami, Kery (December 4, 2004). "Lenin is the star attraction at an only-in-Fremont holiday lighting". Seattle Post-Intelligencer. Retrieved May 28, 2015. ^ MacKenzie, Jean (March 12, 2014). "Fears Of A Russian Takeover Likely Unfounded". Mint Press News. Retrieved March 14, 2014. ^ "Five Lenin statues in unexpected places". BBC News. December 9, 2013. Retrieved March 14, 2014. ^ Butenko, Victoria (December 8, 2013). "Lenin statue toppled in Ukraine protest". CNN. Retrieved March 14, 2014. ^ "Ukraine to remove 10 Soviet-era monuments". Ukrainian Independent Information Agency. RIA Novosti. November 28, 2008. Retrieved March 14, 2014. ^ "Zomrel významný sochár Emil Venkov". Aktuality.sk. June 9, 2017. ^ a b O'Brien, Kirsten; Cohen, Stephen (August 16, 2017). "Small group gathers at Fremont's Lenin statue, calls for its removal". Seattle Post-Intelligencer. ^ Murray, Ed (August 16, 2017). "Mayor Murray statement on Confederate monument in Lake View Cemetery" (Press release). Office of the Mayor, City of Seattle. ^ Hahn, Elisa (August 17, 2017). "Mayor Murray calls for the removal of controversial monuments in Seattle". KING 5 News. ^ deGrandpre, Andrew (August 19, 2017). "In Seattle, people are protesting monuments to the Confederacy — and communism". The Washington Post. ^ "Should we banish Robert E. Lee & his Confederate friends? Let's talk". USA Today. August 16, 2017. Retrieved April 28, 2018. ^ Sillman, Marcie (February 27, 2019). "Lenin statue in Fremont could come down if Republican bill succeeds". KUOW. Retrieved March 13, 2019. Wikimedia Commons has media related to Emil Venkov. Roadside America, "The Seattle Lenin"